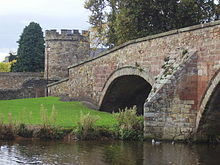 On 23rd August 1548 Francis Talbot, 5th Earl of Shrewsbury arrived in Haddington with a large army for the Siege of Haddington was part of a series of sieges at the Royal Burgh of Haddington, East Lothian. They were part of the larger War of the Rough Wooing, a war started by King Henry VIII in 1543 whilst he was trying to negotiate with the Scottish over a marriage proposal between his son, Edward and Mary, Queen of Scots. Following a defeat at the battle of Pinkie Cleugh in September 1547 the Regent Arran took control of Haddington with 5000 troops including some troops sent by the French King, Henry II. By February 1548 the English led by Grey of Wilton captured the town from the Scottish and set about fortifying the town. The Scottish and French troops began to attack the town in July 1548 when the Scottish organised guns and artillery to be brought from Broughty Castle. Mary of Guise visited the effort of the Scottish troops on 9th July but they encountered the English and 16 of her party were killed. The French eventually ordered their guns to be withdrawn just days later. The English eventually withdrew from Haddington by September 1549 as they ran out of supplies and many of the troops were dead from plague. The French had also sent many more re-inforcements this caused the English to retreat.